You are here: Home » Life Issues & Bioethics » Contraception & Abortion » Who’s Behind India’s Barbaric Mega Sterilization Camps? 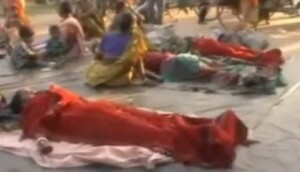 Raw video footage shows unconscious women in saris being unloaded from a filthy plastic stretcher and lined up like butchers’ carcasses on the ground to recover from surgeries at a “mass sterilization camp” in India. The Indian television network, NDTV, aired the film in February, reporting that 103 women were sterilized by two doctors in a single day at the Manikchak Rural Health Center in the Malda district of West Bengal, before being dumped in a nearby field without any medical follow-up. Other reports from India said some women who were anesthetized for invasive tubal ligation procedures were fainting in pain when they regained consciousness. Some were loaded onto rickshaws, still bleeding, in semi-conscious and unconscious states, to be sent home. One woman reportedly fell from a rickshaw following her sterilization and was seriously injured and had to be hospitalized. Westerners may be shocked by the barbarism of these conditions, but Indian human rights activists say they are the norm for the “Mega Sterilization Camps” that dot India today. The governments and international aid agencies that fund such camps turn a blind eye to the gross human rights abuses that occur there in their reckless drive to reduce India’s birth rate. Although India denies having targets for sterilizations, quotas are, in fact, set by local health administrators and are well publicized, she added. In 2011, for example, officials in the district of Rajasthan determined to sterilize 1% of the population. To meet this target, they offered mobile phones to men undergoing vasectomies and lottery tickets for cars, motorcycles and refrigerators to anyone who agreed to be sterilized. While paying people for sterilization is against the law in the U.S. and other countries—and has been widely denounced in India—most Indian states are still in the business of bribing people to give up their fertility. The amounts offered range from 150 rupees (about $2.70 US) to about 600 rupees (about $11 US). So-called Accredited Social Health Activists (ASHA workers) or “motivators” are also paid a bonus for every person from their district that they bring to a sterilization camp. In March, HRLN photographed a sign in a village in Bihar stating that every ASHA worker would be required to bring 12 women and one man in for sterilization. In Bihar there are 8,400 ASHA workers. This means that the ASHA workers, if they met their quotas, would be responsible for over 100,000 sterilizations. Last year, the HRLN filed papers in the Supreme Court of India documenting widespread abuse of the national guidelines governing mass sterilizations. These date from 2005 when the Supreme Court ordered state governments to take immediate action to regulate conditions under which sterilizations were performed to to end coercive practices. The states were also specifically directed to compensate women who suffered complications as a result of sub-standard practices, as well as the relatives of victims who died from botched operations. Eight years on “unsafe sterilization camps are the norm throughout India” still, affirms the HRLN petition, and its attached affidavits include those from some of the 53 lower caste women who were sterilized at a “camp” by a single government doctor in two hours one evening at a high school in Bihar in January 2012. The operations were carried out on school desks which had been shoved together to make a makeshift operating table. Since the school had no electricity or running water, the operations were carried out by flashlight. In their affidavits, the women allege that they were laid out on grass mats on the floor to recover, and that they were medically abandoned after being given a single dose of out-of-date painkillers. One of HRLN’s affidavits, from a Jitna Devi, who was 22 years old at the time, claims that she was three months pregnant when she was sterilized and that she miscarried 19 days later. She also claims she did not understand the procedure would render her permanently sterile. The Union of India and about half of the states have replied to the petition. “The replies have been woefully inadequate,” said McBroom. “They’re basically vague assurances of compliance.” The fact that half of the states haven’t even bothered to respond yet reveals their complacency, she added. In February, the Supreme Court granted an additional six weeks for state governments to respond to the allegations and will reconvene the case in April. “The UNFPA, the World Health Organization, all the state governments, they all know about [these abuses]. They are callous and insensitive,” said Devika Biswas, an activist with HRLN. Whatever the Supreme Court of India rules this spring, it is hard to see how Indian women will be better treated as long as their fertility is tied to foreign aid. Tens of millions of dollars from the US Agency for International Development (USAID), the UK, the World Bank and other population control agencies flows into Indian programs whose primary aim is reducing fertility. A 2008 USAID document discusses implementation of the “population policy” in the state of Uttar Pradesh, for example, whose primary stated goal is reducing the state’s fertility rate from 4.3 to 2.1 by 2016. It is hardly surprising then, that each year 450,000 women in the state undergo sterilizations, most of them at government- sponsored camps. The US budget for health programs in India in the 2011 fiscal year was $78 million, $23 million of which is specifically earmarked for family planning. A U.S. law called the Tiarht Amendment prohibits USAID from funding any family-planning program that has targets or quotas, is coercive, has financial or other incentives or involves non-consensual experimentation. If any of these requirements is violated or a “pattern or practice of violations” emerges, the administrator of USAID has 60 days to submit a report of findings and remedies to the Committee on International Relations and the Committee on Appropriations of the House of Representatives and the Committee on Foreign Relations and the Committee on Appropriations of the Senate. USAID failed to respond to PRI Review’s questions about the relationship of their funding to India’s sterilization camps.